National Gallery West is the new, Montego Bay based extension of the National Gallery of Jamaica. It is part of the newly refurbished and rebranded Montego Bay Cultural Centre, which is housed in the historic Montego Bay Court House on Sam Sharpe Square and was previously known as the Montego Bay Civic Centre. In addition to National Gallery West, the Montego Bay Cultural Centre houses National Museum West (a branch of National Museum Jamaica, which is like the National Gallery a division of the Institute of Jamaica), a gift shop and a café, a large multi-purpose town hall, and outdoor performance space. National Gallery West, which is located in the beautiful domed building at the back of the Montego Bay Cultural Centre complex, will offer four exhibitions per year. At least one of these will be curated specifically curated for National Gallery West, while most of the others will be related to exhibitions shown at the National Gallery of Jamaica in Kingston. Senior Curator O’Neil Lawrence has curatorial oversight over the exhibition programme. The inaugural exhibition, which will be on view from July 11 to August 331, 2014, is Religion and Spirituality in Jamaican Art, an abridged version of the Religion and Spirituality exhibition previously shown in Kingston, which features work by major Jamaican artists such as Carl Abrahams, Osmond Watson, Edna Manley, Albert Artwell, Everald and Clinton Brown, Eugene Hyde, Ralph Campbell, Mallica “Kapo” Reynolds, and Ebony G. Patterson. The Montego Bay Cultural Centre, and National Gallery West, are scheduled to open officially on July 11, 2014 and will be open to the public thereafter. Opening hours are: Tuesday to Sunday 10 am to 6 pm (closed on Monday) and admission is free until September 30. For more information contact the National Gallery of Jamaica at 922-1561 or -63 (Lime), 618-0654 or -55 (Digicel). You can follow National Gallery West on Facebook and at the National Gallery West blog. This is the final text panel post regarding the current Explorations II: Religion and Spirituality exhibition. Our modern Jamaican art galleries will be closed for refurbishing while Religion and Spirituality is on view and several of the works that are normally on view there are included in the present exhibition. However, there are works in our collection that are relevant to the exhibition that were left in their normal location in those permanent galleries that will remain open, mainly because relocating them would have unduly disrupted these displays and, in some instances, because it was not physically possible to relocate the works. Mallica “Kapo” Reynolds is also well represented in the present exhibition but most, if not all of the other work on view in the Kapo Galleries on the second floor is relevant to the themes of Religion and Spirituality. 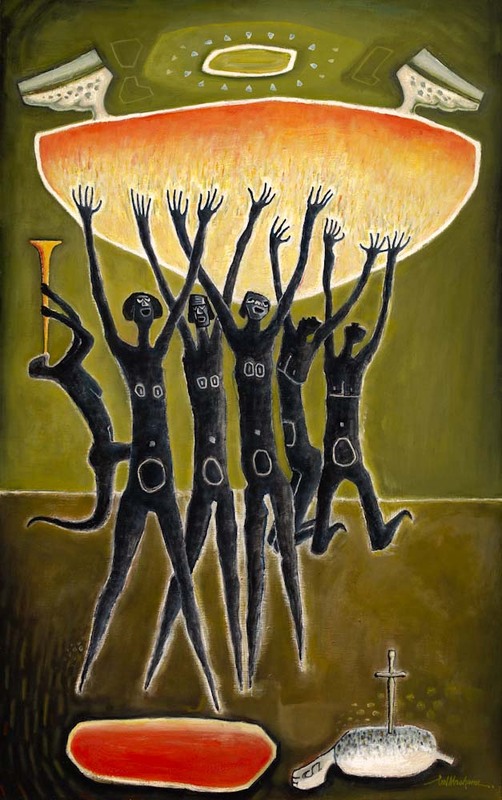 Kapo’s paintings and sculptures collectively provide a vivid portrait of the ritual practices and beliefs of Zion Revival, as a major African-derived popular religion in Jamaica, as well as its general life world, which is captured in a number of portraits, scenes from daily life and landscapes. Kapo himself features prominently in these works, as a Revival community leader and patriarch. Most religious beliefs are crucially concerned with finding meaning in death and thus advance particular conceptions of life after death and this gallery features examples of works that engage in various ways with these subjects, from the perspectives of mainstream Christianity and popular African-derived religion and for other metaphorical purposes. One of Christianity’s central tenets is the self-sacrifice of Christ, by means of his death by crucifixion and his subsequent resurrection and ascension, for the sake of the ultimate redemption of humankind. This perspective is represented here by Carl Abrahams’ Ascension (1978) and Ralph Campbell’s Judgement (1974), both of which interpret mainstream Christian iconography of these subjects, and, from a less conventional perspective in Lawrence Edward’s Rapture (1992). 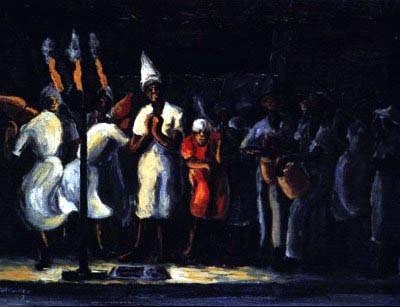 David Pottinger’s haunting Nine Night (1949), in contrast, evocatively captures how the spirits of the deceased are ushered into the beyond in Revival culture, and Revivalist conceptions of the ascent of the spirit are also represented, albeit in a more festive manner, in Mallica “Kapo” Reynolds’ Revivalist Going to Heaven (1968). The work in this gallery consists of various representations and evocations of prayer and ritual and, in doing so, also focuses on the performative nature of popular religions and spiritual practices, particularly the role of music and dance. Revival religion features prominently in this section, for instance Osmond Watson’s celebratory Revival Kingdom (1969) and Day of the Pentecost (1971) or, in a more satirical vein, in Carl Abrahams’ Hallelujah, Hallelujah, Hallelujah (c1965) and Backyard Preacher (c1975). 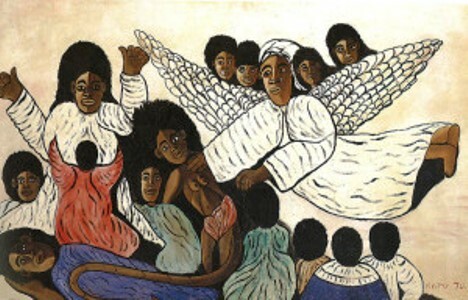 The same exuberant spirit of Revival is also evident in the examples by Revival leader Mallica “Kapo” Reynolds, particularly his Revival Baptism Ceremony (1972) and Allan “Zion” Johnson’s Giving Praise to the Lord (1972), although Kapo is also represented with a more restrained work, Be Still (1970), which represents another side of his spiritual work, namely managing the battle against good and evil and, specifically, the exorcism of evil spirits. The immensely important role of Rastafari in Jamaican music is symbolically represented by Everald Brown’s spectacular Instrument of Four People (1986), which combines a guitar, harp, rhumba box and drum. Music played an important role in the self-appointed mission of the Ethiopian Orthodox Church Brother Brown had established around 1960 and the musical instruments he produced were actively used but, with their unusual sculptural forms and painted and carved decorations also became a full-fledged part of his artistic practice, culminated in masterworks such as the Instrument of Four People, the first of several such hybrid instruments. The instrument-building tradition is continued by his family today. Religion and spirituality played a critical role in the fight against slavery throughout the Americas. In Jamaica, Nanny of the Maroons, had charismatic spiritual powers which she used to empower her followers in guerrilla warfare against the colonial authorities. 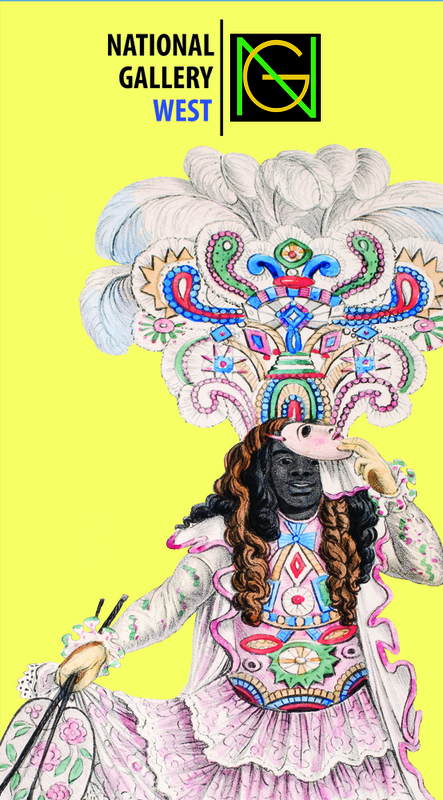 Similarly, Tacky, the leader of the 1760 rebellion, was an Obeah Man and it is worth noting that Boukman Dutty, who presided over the Vodou ceremony at Bois Cayman that marked the start of the Haitian Revolution in 1791, was from Jamaica. 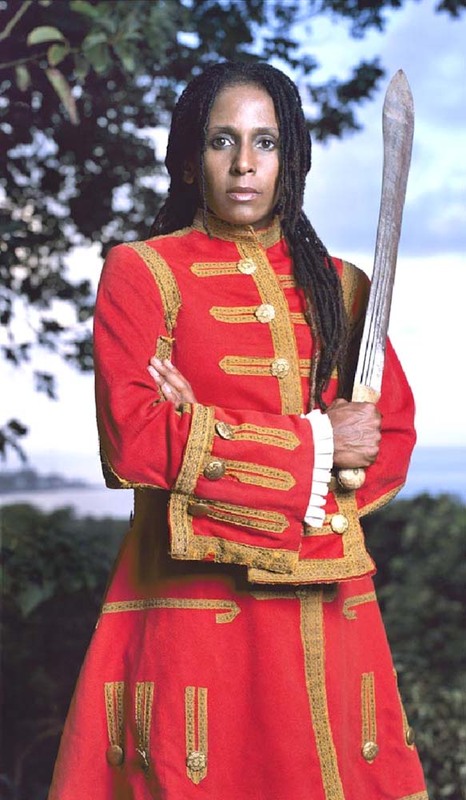 These rebel leaders are symbolically represented in this exhibition by Renee Cox’s The Red Coat, which provides a contemporary interpretation of the figure of Nanny, in which the artist herself adopts Nanny’s persona and in a poignant act of defiance, wears the red coat of the colonial militia. In the late 18th century, the Baptist, Methodist and Moravian Church established missions in Jamaica and became actively involved in the Abolitionist movement. These new religious movements gained significant popular support and interacted with African-derived religious traditions. Out of this came several resistance leaders, such as Sam Sharpe, the leader of the 1831 Christmas Rebellion in western Jamaica, and in the post-slavery area, Paul Bogle, the leader of the 1865 Morant Bay Rebellion. Both were Deacons in the Baptist Church. 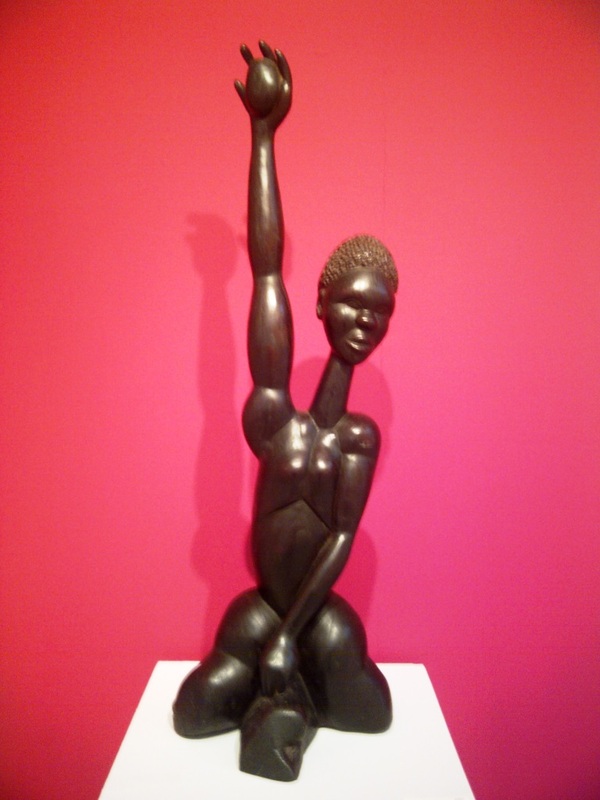 Bogle is represented in this exhibition by a 1952 carving by Kapo, who opted to represent him as one “who threw a stone at the establishment,” the final maquette of Edna Manley’s controversial Bogle monument (1965) and a 2010 poster by Michael Thompson, who represents Bogle as a modern revolutionary. If the white man has the idea of a white God, let him worship his God as he desires. If the yellow man’s God is of his race let him worship his God as he sees fit. We, as Negroes, have found a new ideal. Whilst our God has no colour, yet it is human to see everything through one’s own spectacles, and since the white people have seen their God through white spectacles, we only now started out (late though it be) to see our God through our own spectacles. The God of Isaac and the God of Jacob. We Negroes believe in the God of Ethiopia, the everlasting God – God the Father, God the Son and God the Holy Ghost, the One God of all ages. That is the God in whom we believe, but we shall worship Him through the spectacles of Ethiopia. This perspective is classically illustrated by Osmond Watson’s Peace and Love (1969), which draws from Orthodox Christian icon painting traditions, and the related Jah Lives (1984), which was chosen as the lead image of this exhibition and is on view in the entrance. 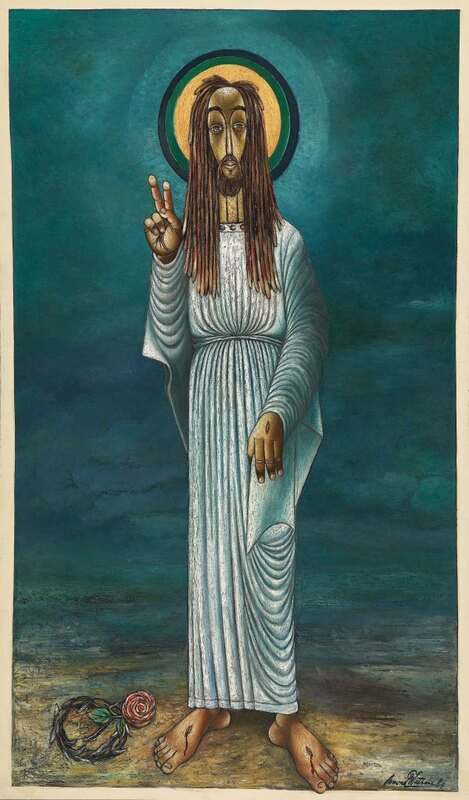 In both instances, Christ is represented as dreadlocked Rastafari, a powerful acknowledgement of the movement’s defining role in Jamaican culture. Peace and Love is also a self-portrait, in an illustration of the Rastafari concept of “Godmanliness,” or the divine nature of the individual. 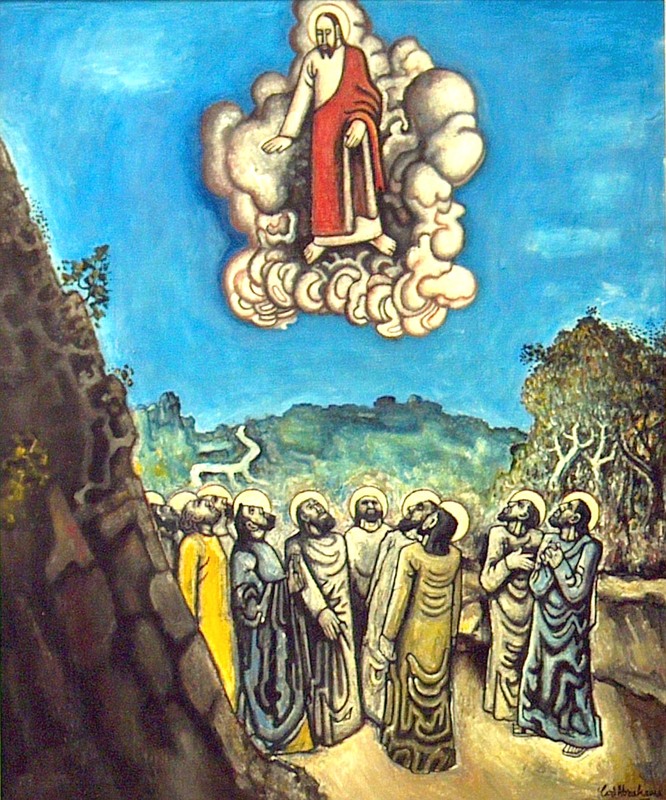 We had originally placed Rastafari artist Albert Artwell’s 33 ½ Years Story of Christ (2005), which narrates the main events in the life of Christ in a style indebted to Ethiopian icon painting, in “A Chapter a Day,” but we moved it to this section because of the assertive Blackness of the imagery, which also has autobiographical allusions.